Our No.1 album for 2008 had everything going for it – it came completely by surprise from New Zealand via the UK, bubbled with some of the finest pOp on the planet, tight production, edgy vocals, inspired lyrics and familiar sounds. It was a most welcome addition to the old CD collection in September this year. We can not for the life of us fathom why Pip Brown wasn’t given any love on local radio – the singles released from the Ladyhawke album ‘Paris Is Burning’, ‘Dusk ‘Til Dawn’ and ‘My Delirium’ were all modern day pOp classics and deserved to be heard. Thankfully, the buzz about Ladyhawke garnered her a cult following and had people clammering for tickets to see her live performances (including at tonight’s sell-out Pyramid Rock Festival on Phillip Island in Victoria). ‘Ladyhawke’ the album was most ‘now’ in it’s sound, but drew on Pip’s childhood influences ranging from Fleetwood Mac to Pat Benatar. 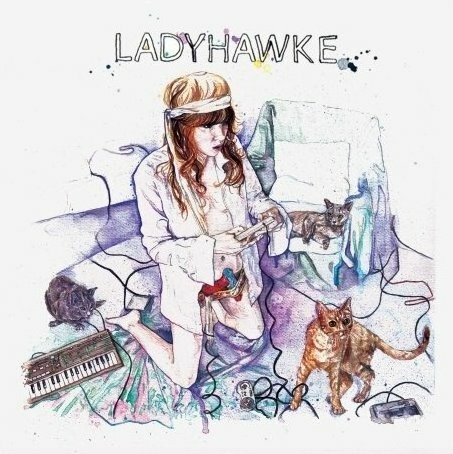 We reckon we summed ‘Ladyhawke’ the album up best in our September review of the album; “Epic, brilliant, soulful, edgy, inspired, genius, intelligent, must-have pOp”. Amen to that – our No.1 album for the year. Pip, it’s yours. Best choice! I LOVED this album and she is a total star! Must’ve been annihilated on the brandy-laced custard, perhaps – thanks for pointing out the mistake. All rectified. Brilliant album indeed, but why does this review make it sound like Ladyhawke is a band? Ladyhawke is the stage name of a solo artist!